Celestina Mascorro, the former caregiver of Martin Knell Sr., is cross-examined by defense attorney Ricardo Salinas during the Monica Melissa Patterson capital murder trial in the 370th state District Court on Monday, October 23, 2017, in Edinburg. EDINBURG — Although facing intense cross-examination from defense attorneys and scrutiny for failing to remember dates and particular details, the individual considered the key witness in the Monica Melissa Patterson capital murder trial didn’t back down from facing the defendant in court on Monday. “Is it funny? It’s not funny, Melissa,” Celestina Mascorro asked the defendant directly, referring to Patterson’s reaction to some of the testimony. Patterson, 50, hired Mascorro in the winter of 2014 to help care for Martin Knell Sr., the 96-year-old man Patterson is on trial for allegedly helping murder Jan. 28, 2015 to gain control of his large estate. The caregiver, long-considered the sole witness to the murder, described to jurors on Friday the circumstances in which Patterson and her alleged co-conspirator — Angel Mario Garza, 39 — arrived at Knell’s house on the morning of his death. 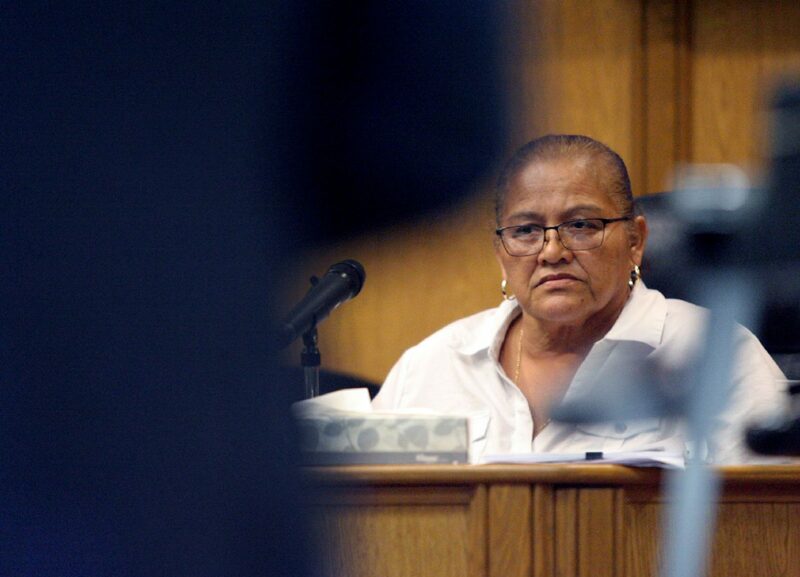 Mascorro also testified that she heard Knell being “smothered” by Garza. But defense attorney Ricardo “Rick” Salinas on Monday attempted to cast doubt on Mascorro’s testimony, cited conflicting statements she made to the jury on Friday and to a Texas Ranger investigator in February 2015, when she first reported the alleged murder. 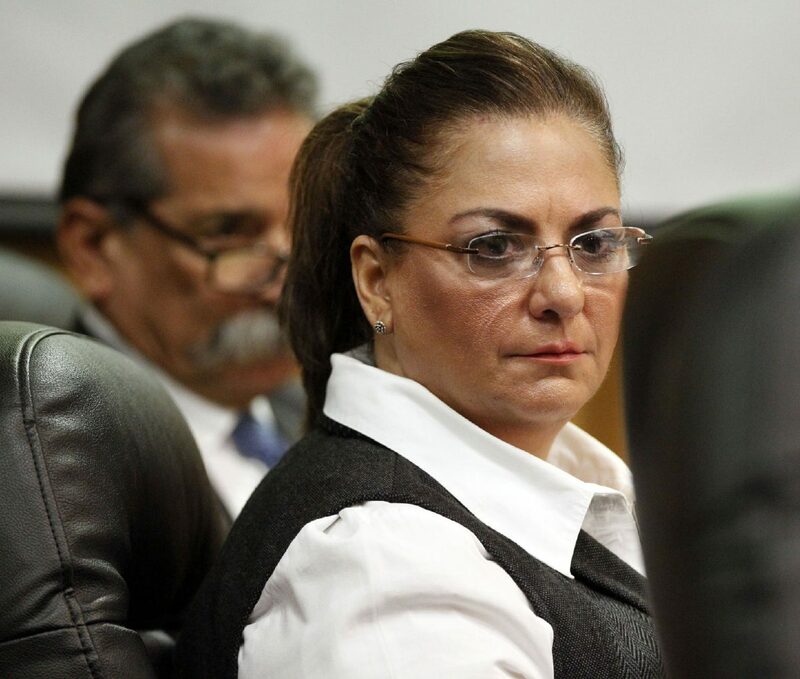 According to Salinas, Mascorro told the investigator that she worked for Knell for six weeks, but in August 2017 changed her statement to two weeks, which is what she told the jury on Friday. Another point of confusion arose when Mascorro was asked about the dates she was in communication with Patterson. These included text message conversations between Mascorro and Patterson that were shown to jurors. They revealed that the two had been in communication about Knell since early January 2015, and the defense argues the caregiver was hired in mid-December 2014. This is according to a text message conversation between Mascorro and Patterson’s sister that was not shown to jurors. “I can’t remember the dates; it’s been a long time,” Mascorro said repeatedly over the course of her cross-examination, adding that she had been “traumatized” by the alleged murder. She also couldn’t remember the number of meetings with the investigator, Robert Callaway, or the number of photographs he took of the text messages. Other subtle nuances dotted Mascorro’s second day on the witness stand, such as giving Knell’s address during the 9-1-1 call she made after finding him unresponsive but forgetting it upon coming forward with the murder allegations. She testified, however, that she had gone outside to double-check the address before making the 9-1-1 call. Salinas’ cross-examination of the witness, which is expected to continue Tuesday, focused not on the events of the morning of Jan. 28, but instead on her knowledge and involvement of Knell’s finances. The defense attorney argued that Knell had left $5,000 for Mascorro among the bundles of cash found in his safe deposit box. She has denied having any knowledge of this money. Such boldness continued from Mascorro, and when asked about Knell’s money, the witness often redirected the questions to the defendant. Text messages between Patterson and Mascorro further showed that Garza had previously been at Knell’s residence prior to the date of the victim’s death. On Friday, Mascorro testified that she was “scared” after Garza called her the evening before Knell’s death asking to be let into the house because she barely knew him. According to a message from Jan. 19, 2015, Garza had gone to the residence to fix the shower, and Salinas pointed out that Mascorro did not communicate any fear to Patterson about that visit. “So based on the text messages, somebody expected Mr. Knell to be alive on Friday, two days after he died on Wednesday?” Salinas said. As the trial neared the end of the day, Salinas mentioned the text messages Mascorro sent Patterson on Jan. 27, 2015 — the night before Knell died. The messages were sent around 7:30 p.m. and did not directly mention Garza, who, according to phone records Callaway collected during the investigation, first called Mascorro around 8 p.m. The remaining messages will likely be presented Tuesday when Mascorro returns to the stand for the remainder of cross-examination.